Spend the evening with some of the founding members of the Rotary Club of Chadstone. For some 1975 seems like yesterday but look what we have achieved. 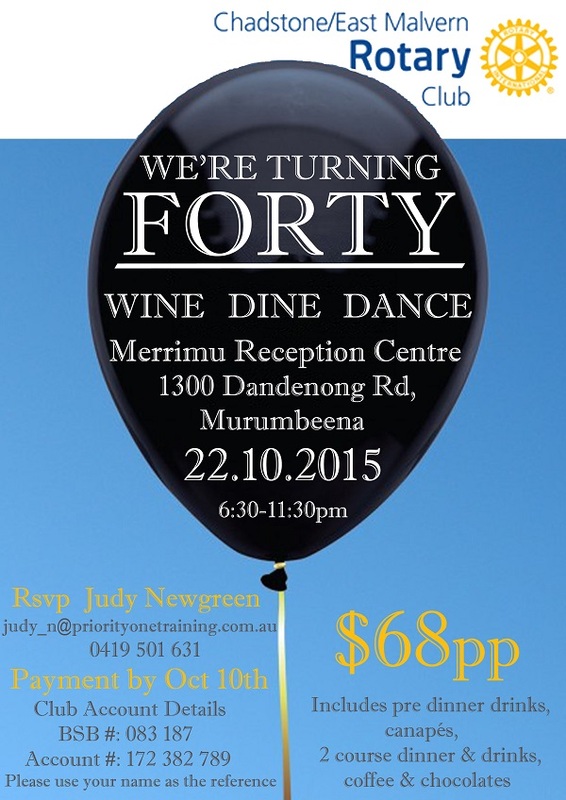 The Rotary Club of Chadstone/East Malvern are turning the big 40 and we would like you to be part of it. It is on a Thursday night exactly 40 years to the day when Rotary Club of Chadstone was chartered. This event replaces our usual Wednesday night meeting. The celebration is to be held at Merrimu Receptions is on Dandenong Road, Murrumbeena. Bring your partners and make this a special night.